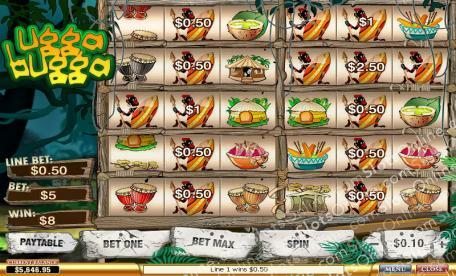 Discover the mysterious secrets of a jungle tribe in the Ugga Bugga slots. Click here to play! A previously undiscovered tribe is rumored to live in this part of the jungle, a people who, according to legend, have found the key to eternal youthful life. Having heard of this, you have set out to learn more about them, but you must be careful not to disturb them in case they move on and hide. In order to learn about the key to eternal life, you will need to document how they live by studying their huts and diet. They live in three different kinds of housing, but you will need to compare three similar kinds in order to make any progress and receive more funding for your research. Their diet consists of many exotic jungle foods that seem to give the warriors exceptional strength. If you can document the recipes of the tribe's food and the training regimen of the warriors, you could surely get a boost to your grant money. While you may be a scientist, you still have an open mind and will explore the possibility of whether the tribe's spiritualism and religion play a role in their unusually long lives. The drums and masks that they use for their daily prayers have an intriguing effect of rejuvenation on those who use them. Even more interesting, the golden idols they pray to appear to glow, even when only the smallest light is present. If magic were to exist, it would certainly rest in these golden idols, and untold riches would be guaranteed if you could take all three back to your research facility for further study. There is much work to be done if the secrets of the Ugga Bugga slots are to be uncovered. Hurry! To the jungle! Golden idol symbols are wild and may substitute for any other symbol.